I have been doing what I wore Wednesday posts once a week for a full month now and I am surprised at how much a little effort has changed how I feel each day! I am really starting to enjoy the things that I already have in my closet. Instead of grabbing the same old t-shirt and yoga pants I’m utilizing the things that I already have in a much better way. I am a t-shirt and jeans kind of girl at heart, always have been always will be. 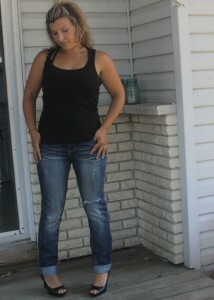 This week since the weather cooled down a little I was happy to included jeans instead of shorts in my outfits. I came up with three simple jeans and tank top outfits that I felt very comfy and confident in! Wednesday: Doing hair with my mother and sister in laws. This was my Pinterest inspired outfit of the week and I loved it lots. Here is the image that I used for inspiration found on the blog Friend In Fashion. My take on the outfit uses a less than $4.00 tank top that I already had from Walmart. The photo inspired me to try some kind of crazy “rock-star” type hair for the day and I think it was fitting with the outfit! I have to be honest, the heels did not last long, but I would definitely sport them out on a fun date night or something like that – they are really a great way to fancy up a plain old tank top and jeans! Hair: I went for a messy version of my natural curls, little product and some backcombing for height. I backcombed, smoothed, and pinned by bangs back. I am really finding that the less I am doing to my hair these days the more I am loving it, which is a great thing for this busy mom! Thursday: Running errands, taking the dog to the vet, and to a family birthday party with the kids. hair: natural waves in a side braid with messy wavy bangs down. Quick and easy. I was reluctant to sport the white skinny jeans so a long flowing tunic made me feel a little more comfortable in them. This was a super comfy and fun outfit for a summer day. And we can’t forget to talk about the pink streaks in my hair. This was one of those impromptu things that I have been really wanted to test out for a while. I have seen many images and tutorials on “hair chalking” over the past several months and have had the chalk pastels just waiting around the house for an opportunity to give it a whirl. We had a spare hour on Sunday morning that I gave it a try. SO FUN – and really very simple to do. I found a process that worked for me and the color stayed in until it was shampooed. Washed right out with no trouble. I will give you a how-to post as soon as I get a chance! 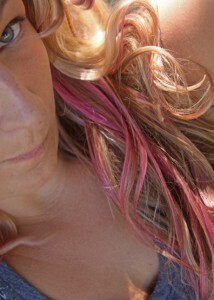 As soon as my little lady saw my pink streaks she begged for some too. She choose purple and pink and adored her fun color for the day! I put one streak in to start and then she begged for more. Can’t wait to share with you all how we did it! Well what do you think? After a month of blogging what I wore for the week I am getting really brave with my style – pink streaks, and white skinny jeans. Never thought I would see the day – especially after spending 3 years in pajama pants all day. Should I keep up the posts or are we more interested in craft projects and recipes? I love these posts and I think you should keep them up! But only if you take me shopping and help me get some style! 😉 just kidding, but it would be fun to go shopping together again! Done Deal! I would LOVE to! I have no idea how I started following you but I am fascinated with most everything you post. The whole concept of dressing for Wednesday hit a spot I hadn’t even realized had happened…..(I’m new to being at home every day all day.) And my choice of clothes these days are not pretty…..Love your styles (over all) I am older and a bit more conservative but it’s the idea that is inspiring….thanks a bunch! Well, I am glad you found me and I thank you for the kind comment! I am so glad that the posts are inspiring to you, especially because when I was a new stay at home mommy I really stopped caring about myself (and not so very long ago)! It has been fun to rediscover myself and my style but this time as a mom on the go! 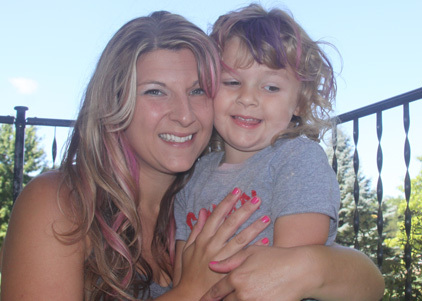 Thanks again for the comment – does that mean you won’t be trying the pink streaks in your hair :)? I love the flowing tank you wore with the skinny white jeans. I am not a small girl. But I would like to have style! I can never find anything in my size that is cute and stylish like this. It is quite depressing. HELP!! I find that the more formfitting things I wear – the better it actually looks. When I buy over-sized tunics or flowing tops they always look better if I buy them a size smaller than I normally wear – probably because I am pretty short. My advice would be heels or wedges – they always make you look taller and put together. Other than that make sure you are comfortable in what you are wearing! If you aren’t – it’s hard to rock an outfit and look confident – that is always first for me – if I feel self conscious in it – I don’t leave the house in it! Wear what you love – for instance I might dress a little less conservative than other Moms but I feel great in what I’m wearing and that’s all that really matters. Y’all are so cute!! Love that you took pinspiration and made it a reality! 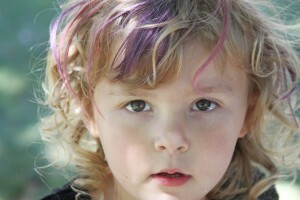 You have FAB hair and I can’t wait for the tutorial on chalking! Thank you kindly! 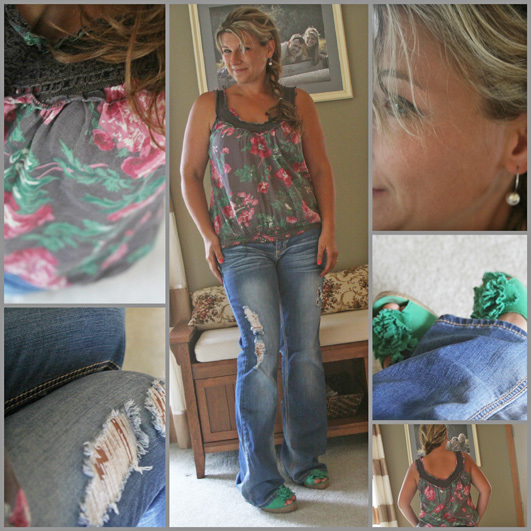 I love Pinterest for geting inspiration on ways to wear what I already have – it is a great resource! You are rockin’ the jeans. Love each outfit and I really love the pink streaks. 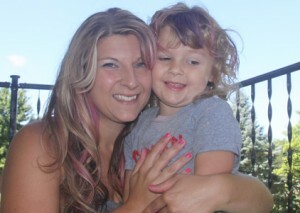 My daughter has been wanting to try out chalking her hair. We’ll have to give it a try. Thank you so much! I am super excited to share a hair chalking how-to soon – it is so cool that it is so temporary but gets such vivid results! Thanks for stopping by! I say keep them coming. It is inspiring, especially when you show how it can be done without breaking the bank – and look fabulous. They’re realistic outfits, possible for everyone if they just take a little more time and thought. I’m enjoying them! I’m glad you are enjoying them! Thanks for the encouragement! I will keep them coming! You are the cutest thing I pinned your flower outfit to my I’m so gonna wear this board it is more of an inspiration board as I am on a life change journey. I followed you on Pinterest too. Aww – thank you for the comment and for the pin too! Inspiration comes in so many forms and it touches my heart that my flower outfit made your Inspiration board! Whatever your life long journey is – remember that you can do hard things and that life is what YOU make it!! 🙂 Thanks again for stopping by and bless you for getting inspired (not everyone can)! I think you rocked the black tank and jeans outfit. I need to try to replicate some of my favorite looks from websites. It’s such a good idea. Thanks! It really helps me use what I have to create outfits I never would have thought up! Give it a go!